When it comes to looking beyond our Solar System, astronomers are often forced to theorize about what they don’t know based on what they do. In short, they have to rely on what we have learned studying the Sun and the planets from our own Solar System in order to make educated guesses about how other star systems and their respective bodies formed and evolved. For example, astronomers have learned much from our Sun about how convection plays a major role in the life of stars. Until now, they have not been able to conduct detailed studies of the surfaces of other stars because of their distances and obscuring factors. However, in a historic first, an international team of scientists recently created the first detailed images of the surface of a red giant star located roughly 530 light-years away. The study recently appeared in the scientific journal Nature under the title “Large Granulation cells on the surface of the giant star Π¹ Gruis“. The study was led by Claudia Paladini of the Université libre de Bruxelles and included members from the European Southern Observatory, the Université de Nice Sophia-Antipolis, Georgia State University, the Université Grenoble Alpes, Uppsala University, the University of Vienna, and the University of Exeter. For the sake of their study, the team used the Precision Integrated-Optics Near-infrared Imaging ExpeRiment (PIONIER) instrument on the ESO’s Very Large Telescope Interferometer (VLTI) to observe the star known as Π¹ Gruis. Located 530 light-years from Earth in the constellation of Grus (The Crane), Π1 Gruis is a cool red giant. While it is the same mass as our Sun, it is 350 times larger and several thousand times as bright. For decades, astronomers have sought to learn more about the convection properties and evolution of stars by studying red giants. These are what become of main sequence stars once they have exhausted their hydrogen fuel and expand to becomes hundreds of times their normal diameter. Unfortunately, studying the convection properties of most supergiant stars has been challenging because their surfaces are frequently obscured by dust. After obtaining interferometric data on Π1 Gruis in September of 2014, the team then relied on image reconstruction software and algorithms to compose images of the star’s surface. These allowed the team to determine the convection patterns of the star by picking out its “granules”, the large grainy spots on the surface that indicate the top of a convective cell. This study is especially significant because Π1 Gruis in the last major phase of life and resembles what our Sun will look like when it is at the end of its lifespan. In other words, when our Sun exhausts its hydrogen fuel in roughly five billion years, it will expand significantly to become a red giant star. At this point, it will be large enough to encompass Mercury, Venus, and maybe even Earth. As a result, studying this star will give scientists insight into the future activity, characteristics and appearance of our Sun. For instance, our Sun has about two million convective cells that typically measure 2,000 km (1243 mi) in diameter. Based on their study, the team estimates that the surface of Π1 Gruis has a complex convective pattern, with granules measuring about 1.2 x 10^8 km (62,137,119 mi) horizontally or 27 percent of the diameter of the star. The detailed map also indicated differences in surface temperature, which were apparent from the different colors on the star’s surface. This are also consistent with what we know about stars, where temperature variations are indicative of processes that are taking place inside. As temperatures rise and fall, the hotter, more fluid areas become brighter (appearing white) while the cooler, denser areas become darker (red). Looking ahead, Paladini and her team want to create even more detailed images of the surface of giant stars. The main aim of this is to be able to follow the evolution of these granules continuously, rather than merely getting snapshots of different points in time. From these and similar studies, we are not only likely to learn more about the formation and evolution of different types of stars in our Universe; we’re also sure to get a better understanding of what our Solar System is in for. The study of extra-solar planets has revealed some fantastic and fascinating things. For instance, of the thousands of planets discovered so far, many have been much larger than their Solar counterparts. For instance, most of the gas giants that have been observed orbiting closely to their stars (aka. “Hot Jupiters”) have been similar in mass to Jupiter or Saturn, but have also been significantly larger in size. Ever since astronomers first placed constraints on the size of a extra-solar gas giant seven years ago, the mystery of why these planets are so massive has endured. Thanks to the recent discovery of twin planets in the K2-132 and K2-97 system – made by a team from the University of Hawaii’s Institute for Astronomy using data from the Kepler mission – scientists believe we are getting closer to the answer. The study which details the discovery – “Seeing Double with K2: Testing Re-inflation with Two Remarkably Similar Planets around Red Giant Branch Stars” – recently appeared in The Astrophysical Journal. The team was led by Samuel K. Grunblatt, a graduate student at the University of Hawaii, and included members from the Sydney Institute for Astronomy (SIfA), Caltech, the Harvard-Smithsonian Center for Astrophysics (CfA), NASA Goddard Space Flight Center, the SETI Institute, and multiple universities and research institutes. To address this, Grunblatt and his colleagues searched through the data collected by NASA’s Kepler mission (specifically from its K2 mission) to look for “Hot Jupiters” orbiting red giant stars. These are stars that have exited the main sequence of their lifespans and entered the Red Giant Branch (RGB) phase, which is characterized by massive expansion and a decrease in surface temperature. As a result, red giants may overtake planets that orbit closely to them while planets that were once distant will begin to orbit closely. In accordance with a theory put forth by Eric Lopez – a member of NASA Goddard’s Science and Exploration Directorate – hot Jupiter’s that orbit red giants should become inflated if direct energy output from their host star is the dominant process inflating planets. So far, their search has turned up two planets – K2-132b and K2-97 b – which were almost identical in terms of their orbital periods (9 days), radii and masses. Based on their observations, the team was able to precisely calculate the radii of both planets and determine that they were 30% larger than Jupiter. Follow-up observations from the W.M. Keck Observatory at Maunakea, Hawaii, also showed that the planets were only half as massive as Jupiter. The team then used models to track the evolution of the planets and their stars over time, which allowed them to calculate how much heat the planets absorbed from their stars. As this heat was transferring from their outer layers to their deep interiors, the planets increased in size and decreased in density. Their results indicated that while the planets likely needed the increased radiation to inflate, the amount they got was lower than expected. While the study is limited in scope, Grunblatt and his team’s study is consistent with the theory that huge gas giants are inflated by the heat of their host stars. It is bolstered by other lines of evidence that hint that stellar radiation is all a gas giant needs to dramatically alter its size and density. This is certainly significant, given that our own Sun will exit its main sequence someday, which will have a drastic effect on our system of planets. It is hoped that future surveys which are dedicated to the study of gas giants around red giant stars will help settle the debate between competing planet inflation theories. For their efforts, Grunblatt and his team were recently awarded time with NASA’s Spitzer Space Telescope, which they plan to use to conduct further observations of K2-132 and K2-97, and their respective gas giants. The search for planets around red giant stars is also expected to intensify in the coming years with he deployment of NASA’s Transiting Exoplanet Survey Satellite (TESS) and the James Webb Space Telescope (JWST). These missions will be launching in 2018 and 2019, respectively, while the K2 mission is expected to last for at least another year. How’s this for a depressing look into Earth’s potential future: astronomers have witnessed the first evidence of a planet’s destruction by its aging star as it expands into a red giant. “A similar fate may await the inner planets in our solar system, when the Sun becomes a red giant and expands all the way out to Earth’s orbit some five-billion years from now,” said Alex Wolszczan, from Penn State, University, who led a team which found evidence of a missing planet having been devoured by its parent star. Wolszczan also is the discoverer of the first planet ever found outside our solar system. The planet-eating culprit, a red-giant star named BD+48 740 is older than the Sun and now has a radius about eleven times bigger than our Sun. The evidence the astronomers found was a massive planet in a surprising highly elliptical orbit around the star – indicating a missing planet — plus the star’s wacky chemical composition. “Our detailed spectroscopic analysis reveals that this red-giant star, BD+48 740, contains an abnormally high amount of lithium, a rare element created primarily during the Big Bang 14 billion years ago,” said team member Monika Adamow from the Nicolaus Copernicus University in Torun, Poland. “Lithium is easily destroyed in stars, which is why its abnormally high abundance in this older star is so unusual. The other piece of evidence discovered by the astronomers is the highly elliptical orbit of the star’s newly discovered massive planet, which is at least 1.6 times as massive as Jupiter. Because gravitational interactions between planets are responsible for such peculiar orbits, the astronomers suspect that the dive of the missing planet toward the star could have given the surviving massive planet a burst of energy, throwing it into an eccentric orbit like a boomerang. The team used the Hobby-Eberly Telescope – searching for planets – when they detected evidence of the missing planet’s destruction. The paper describing this discovery is posted in an early online edition of the Astrophysical Journal Letters (Adamow et al. 2012, ApJ, 754, L15), or another version is available on arXiv. It’s not quite like being kicked off a reality TV show, but some stars can get kicked out from their home galaxy. These stars – called various names like rogue, runaway or hypervelocity stars – were predicted to exist for quite some time, and finally just in the past couple of years a few of them have actually been discovered. But now a group of nearly 700 rogue stars have been found on the outskirts of the Milky Way. The astronomers who found them argue they are hypervelocity stars that have been ejected from the center of the galaxy. “These stars really stand out. 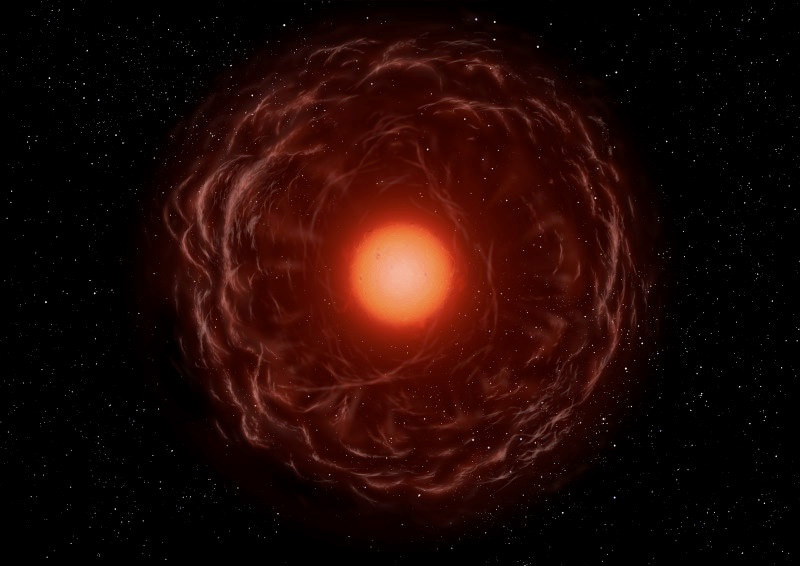 They are red giant stars with high metallicity which gives them an unusual color,” said Kelly Holley-Bockelmann from Vanderbilt University, who conducted the study with graduate student Lauren Palladino. They found these stars analyzing the millions of stars cataloged in the Sloan Digital Sky Survey. “We figured that these rogue stars must be there, outside the galaxy, but no one had ever looked for them. So we decided to give it a try,” said Holley-Bockelmann, who is studying the behavior of the black hole at the center of the Milky Way galaxy. Runaway stars are kicked into motion either through a supernova explosion of a companion star, through gravitational interactions with other stars in a cluster, or through encounters with a black hole. One scenario could involve a binary pair of stars that get caught in the black hole’s grip, and as one of the stars spirals in towards the black hole, its companion is flung outward at a tremendous velocity. This is the scenario the researchers focused on, and so they looked for red giant stars just outside the Milky Way. Red giant stars are the end stage in the evolution of small, yellow stars like the Sun. So, the stars in this new red giant rogues category should have been small stars like the Sun when they got ejected. As they traveled outward, they continued to age until they reached the red giant stage. Even traveling at hypervelocities, it would take a star about 10 million years to travel from the central hub to the spiral’s edge, 50,000 light years away. There are a few methods for discovering runaway rogue stars. The first is to examine stars individually and analyze their motion in the plane of the sky (proper motion) along with their motion towards or away from us (radial velocity) to determine if a given star has sufficient velocity to escape. The second is to look at the effects some stars have on the local environment. 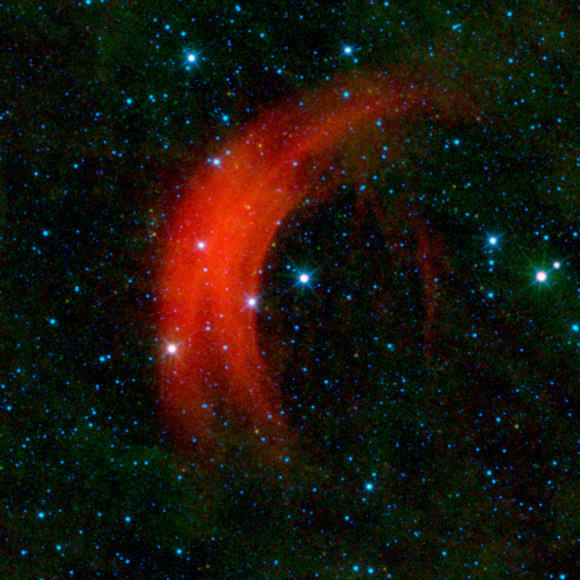 Since young clusters contain large amounts of gas and dust, stars plowing through it will create bow shocks, similar to those a boat makes in the ocean. The team from Vanderbilt selected these stars based on their location in intergalactic space between the Milky Way and the nearby Andromeda galaxy and by their peculiar red coloration. The researchers’ next step is to determine if any of their candidates are unusually red brown dwarfs instead of red giants. Because brown dwarfs produce a lot less light than red giants, they would have to be much closer to appear equally bright. Stars get pretty sloppy towards the end of their lives. As the nuclear fuels start to wane, the star pulsates – expanding and contracting like a marathon runner catching her breath. With each pulsation, the dying star belches out globs of gas into space that eventually get recycled into a new generation of stars and planets. But accounting for all that lost material is difficult. Like trying to see a wisp of smoke next to a stadium spotlight, observing these tenuous sheets of stellar material swirling just over the surface of the star is considerably challenging. However, using an innovative technique to image starlight scattering off interstellar grains, astronomers have finally succeeded in seeing ripples of dust flowing off dying stars! The stars – W Hydra, R Doradus, and R Leonis – are all highly variable red giants, stars that are no longer fusing hydrogen in their cores but have moved on to forming heavier elements. Each is completely enveloped by a very thin dust shell most likely made up of minerals like forsterite and enstatite. These grains can only form once the raw ingredients have flowed some distance from the star. At distances roughly equal to the size of the star itself, the gas has cooled enough to allow atoms to start sticking together and forming more complex compounds. Minerals like these will go on to seed asteroids and possibly rocky planets like the Earth in the continual cycle of death and rebirth playing out in the Galaxy. The paper describing this discovery, accepted to the journal Nature, can be found here. The astronomers who recently reported this discovery used the eight meter wide Very Large Telescope in the Chilean Atacama Desert – and a suite of clever tools – to tease out the subtle reflections off these dust shells. The trick to seeing light bouncing off interstellar dust particles involves taking advantage of one of light’s wave properties. Imagine you had a length of rope: one end is in your hand, the other tied to a wall. You start to wiggle your end and waves travel down the cord. If you move your arm up and down, the waves are perpendicular to the floor; if you move your arm from side to side, they are parallel to it. The orientation of those waves is known as their “polarization”. If you mixed things up by constantly changing the direction in which your arm was oscillating, the orientation of the waves would be similarly confused. The rope would bounce in all directions. With out a preferred direction of movement, the rope waves are said to be “unpolarized”. Light waves emitted from the surface of star are just like your chaotic rope flinging. The oscillations in the electric and magnetic fields that make up the propagating light wave have no preferred direction of motion – they are unpolarized. However, when light bounces off a dust grain, all that confusion drops away. The waves now oscillate in roughly the same direction, just as if you decided to only bounce the rope up and down. Astronomers call this light “polarized”. A polarizing filter only allows light with a specific orientation to pass through. Hold it one way, and only “vertically polarized” light – light where the electric field is oscillating up and down – will pass. Turn the filter ninety degrees, and you’ll only transmit “horizontally polarized” light. If you have polarizing sunglasses, you can try this yourself by rotating the glasses and watching how the the scene through the lenses gets brighter and darker. This is also a nice demonstration of how our atmosphere polarizes incoming sunlight. A shell of dust around a star will polarize the light that bounces off it. Just like the sky gets brighter and dimmer as you turn your sunglasses, looking at a such star through differently oriented polarizing filters will reveal a halo of polarized light surrounding it. The different orientations will reveal different segments of the halo. By combining polarimetric observations with interferometry – the beating together of light waves from widely separated spots on a telescope mirror to create very high-resolution images – a thin ring of scattered light reveals itself around these three stars. These new observations represent a milestone in our understanding of not only a star’s end game but also the production of interstellar dust that follows. Like the smokestacks of great factories, red giant stars expel a soot of minerals into space, carried aloft by stellar winds. With meticulous observation, results such as these can help tie together the death of one generation of stars with the birth of another. Unraveling the mysteries of grain formation in space takes us one step closer to piecing together the many steps that lead from stellar death to the creation of rocky planets like our own.